as she reopens the 30-year-old case that put her psychiatrist father, Dr Archie Chisholm in prison for the murder of his wife, the mother of Gemma and her sister, psychotherapist Kit. 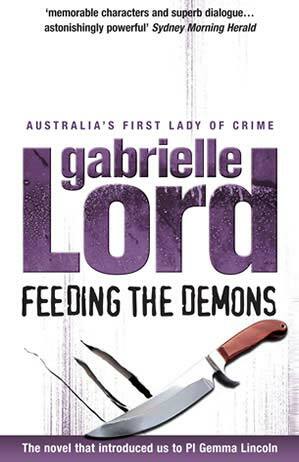 Waking up one morning in a motel, Gemma finds her clothes laid out on the floor in an effigy of a woman, viciously slashed around the throat and the crotch. Her best friend detective Sergeant Angie McDonald calls her in to watch a crime scene video. This time, instead of an effigy made out of clothes, the killer has targeted a real woman. A visiting American blood splatter expert has viewed the crime scene photographs from the murder of their mother and all the evidence points to the innocence of Dr Archie Chisholm, their father. Gemma woke, bewildered because the grey dawn light was coming from the wrong side. Then she remembered she wasn’t at home. She lay there for a moment listening to the early morning sounds; the lift’s clunking, the hotel’s plumbing, the hum of the air-conditioner. She walked into the lounge area to retrieve the rest of the clothes that stopped short in the doorway. A chill of fear flashed through her body as hair follicles, obeying a primitive directive, stiffened. She felt the rush of adrenalin, that explosion of icy fire. Now she understood why her clothes that looked almost laid out when she glanced without attention earlier. At the police Centre, detective Sergeant Angie McDonald asked “What’s this about? One of your surveillance tapes?” She slid the cassette into the housing and pressed ‘Play’, fast forwarding it. “Stop!” cried Gemma. “Right there.” The picture suddenly froze, the slashed crotch of the pantyhose, the knifed skirt shimmering in freeze-frame, then Gemma started the tape rolling again. Angie left, then returned a few moments later with another cassette, slid it home and switched it on. “Authorised Police Personnel Only” Gemma read on the screen. Angie fast forwarded it and when the tape stopped, Gemma’s eyes widened. There, on another carpet, on another floor, with different clothes, was the same thing. Another skirt and underwear slashed, the shoes laid out either side of the sheer nylon feet, another pretty blouse ripped apart with a knife cuts, talcum powder sprinkled at the opening of the sleeves and over the crotch.